Wow Wow Wow! 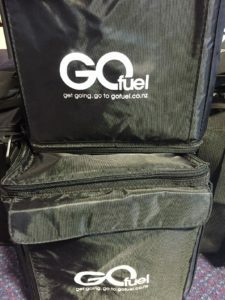 What a cool event, with cool people, great prizes and just a great vibe! In a season of largely windy weather the ladies really scored perhaps the best that could be expected. Just prior to the Thursday night briefing the weather eased with the Gale Force warning being dropped and it became clear that the days ahead were going to be better than the original forecast. So although it was a little bit sloppy for the Friday morning, the girls could look forward to much calmer seas over the days ahead. 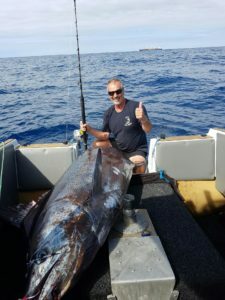 As always, there is always a good deal of marlin and tuna fever around although this season is proving harder than the last two to catch one of these elusive beasts. 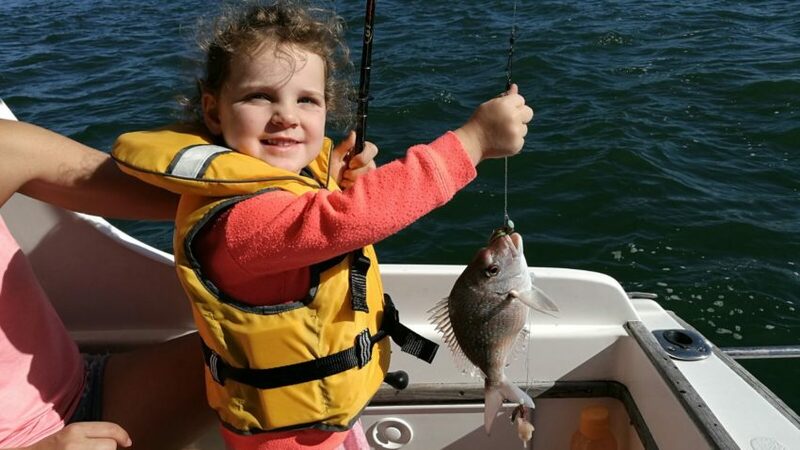 Offshore water conditions despite being blue and 20 degrees plus just seem to be devoid of the usual bait schools. 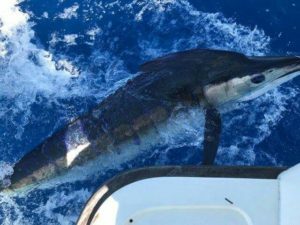 It could be the season is just 6 weeks late, regardless the offshore fishing was tough this year. 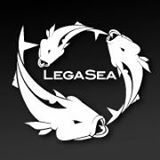 Lucky the Fish N Chicks fish schedule comprises many more species than just the hard to get pelagics. 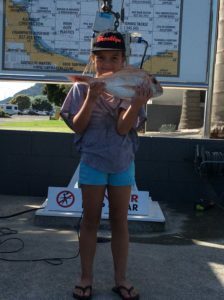 With terakihi, snapper, and kingfish on the list it gives the ladies the option of hugging the islands or the inshore and having a great crack at winning some prizes. 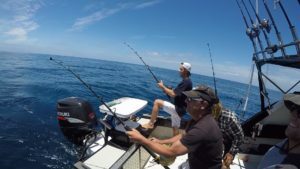 Somehow after doing the hard yards offshore a spot line fishing can be more relaxing and enjoyable, two qualities most teams in this event look for in the ‘perfect day fishing’. 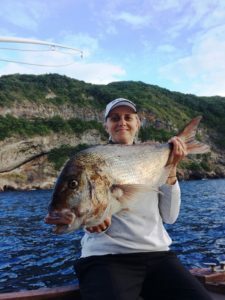 Three good Kingies came across the weigh station scales the best of them being a 24.32kg model to Michelle Clark on board Wai Whare Charters, followed by a nice 17.88kg fish for Anita Syben on Apteryx these out of G Fab Trailers and High Duty Plastics. Some quality snapper were also caught the best of them a 7.665kg model to Tracey Holmes on board Sterling Belle. 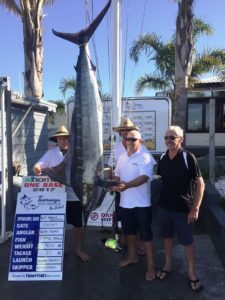 Second place in the snapper went to Rhoda Phillip 5.87kg, and backed up by her team mate Kylie Silby 4.52kg both on board the boat Bliss. The offshore efforts where not completely without reward with Cobar II striking first landing a stripey on the inside of Mayor in the green water! Unfortunately this fish came up tail wrapped and could not be revived. 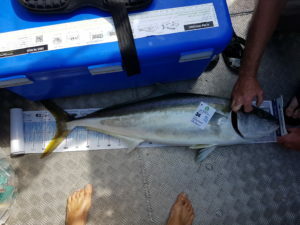 Although the fish didn’t quite make qualifying weight at 74kg but was a massive buzz for the team and Kelly Whifen who made the trip over from Australia. 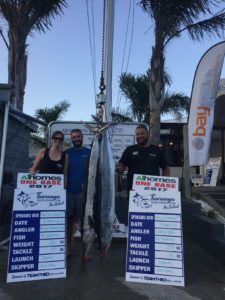 Not wanting to miss out Emma Keyworth on Jans Decision managed a tag and release Striped Marlin as did Anita Syben again on Apteryx who seemed to be enjoying an action packed tournament! Giving up on the offshore quest the team on Free Flo decided to hit Mayor in the hope of hitting pay dirt on the Tarakhi. 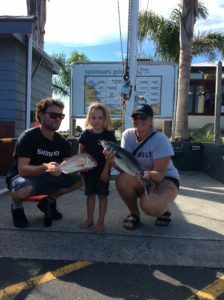 They did just that managing a first and second place fish for Many Kupenga and sponsor Jodie Gollop with a 1.885 and 1.72kg respectively from Champness Roofing. Congratulations ladies! 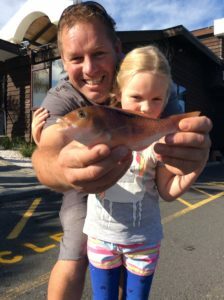 This was the second year the HERO SHOT was run with the support of Tauranga SPARK BUSINESS HUB offering an Iphone 7 as incentive to get the best Fish N Chick on the water photo. 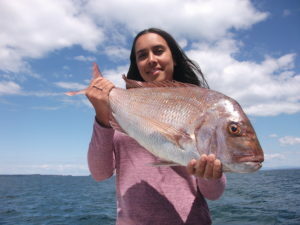 We were flooded with entries as these can all be found on our Facebook site and our website tsfc.co.nz Mandy Kupenga our HERO SHOT judge had her work cut out in sorting out the three top places but finally got there naming Kelly Whiffen’s on-board marlin shot number one, young Jovanna Pillay took out second with a very nice snapper perfectly positioned in great light, and in third was Tracey Holmes with her outstanding Mayor Island snapper. We had some great shots with a good deal of creativity in all of the entries so congratulations to everyone that got involved! Prize giving was outstanding with all of the fancy dress teams going too extreme measures to impress. Supported by the Radical Kids Band the “Quick fire Runaway” was a hit giving piles of laughs along the way. 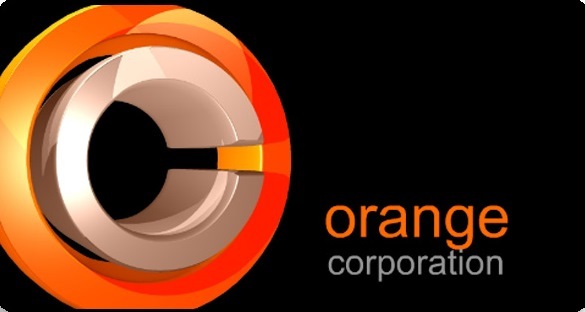 Well done to the Xarisma 1st, SunKist 2nd and Ultimate Brandys finishing strongly in third! Thankyou to all of our Sponsors especially Bridgeman Concrete (well done achieving 50 years in business!) 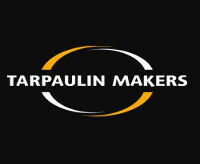 and a massive thankyou to all of our lady anglers for your great energy and enthusiasm you bring to this event. 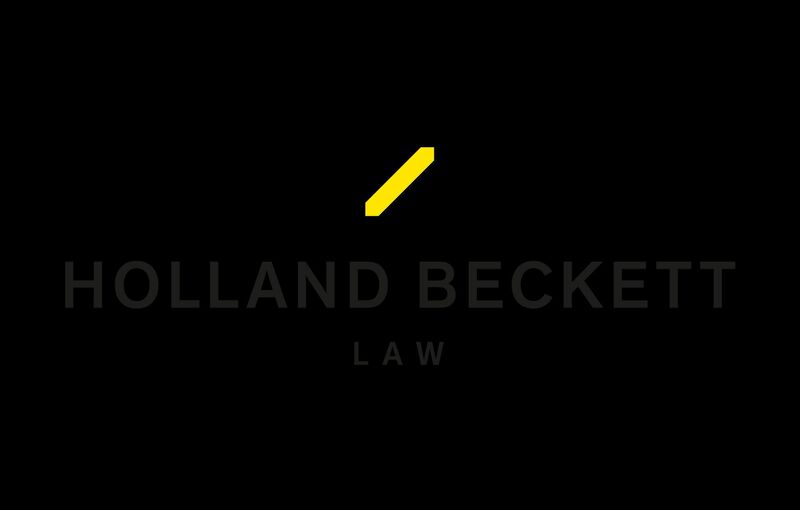 We look forward to seeing you all back next year! 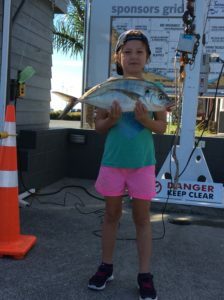 The postponement on the 22-24th January turned out to be absolutely the right call as the weather that folded over the Bay of Plenty that weekend was truly awful. 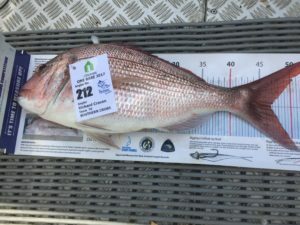 The postponed sunday delivered 5 metre seas and 43 knots of Northerly that was hoped to drive in the warmer water that had been held off for weeks by the strong south westerlies. Fast forward a week and the forecasted stationary High did its best to deliver on the promise of good weather for our new dates but fell short with winds offshore touching 20knots early Saturday morning and leaving many tucked in behind Mayor enjoying a longer than usual breakfast. By midday the winds eased right up and the good weather rolled in letting all boats explore far and wide. 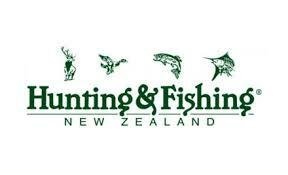 This year’s GAME ON attracted 119 anglers, slightly down on last year. It looked like we lost a few teams to long weekend commitments, which just made the odds better for those that showed. 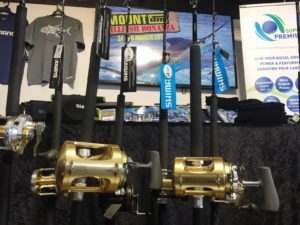 Fantastic prizes from Shimano and Maui Ocean Products adorned the stage and with $10000 in cash pooled in the Calcutta it was Game On for anniversary weekend! 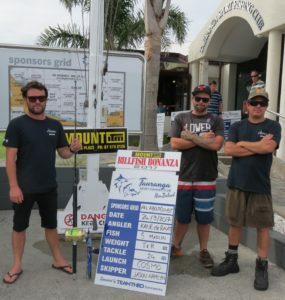 Andros, Sunkist, Jans Decision and Brothers in Arms all experienced the misfortune of dropping marlin that were desperately needed for the Calcutta Billfish points. 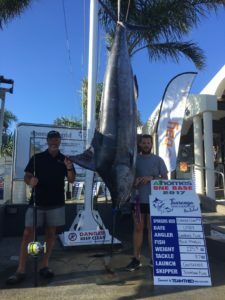 Instead Aaron Layne who was fishing solo on Ocean Warrior managed a large 30.6kg Shortbilled Spearfish early on Sunday morning, this qualifying in the Billfish category for the Calcutta. 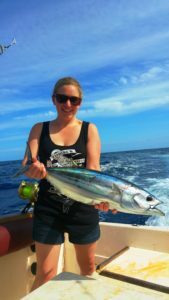 The hogs aboard Aquarius seem to have the midas touch running over a big school of Yellowfin tuna hooking and landing four! 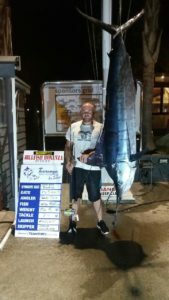 Eventually no marlin would stick, so it was to be that the Ocean Warrior Spearfish would take out first place in the Calcutta. 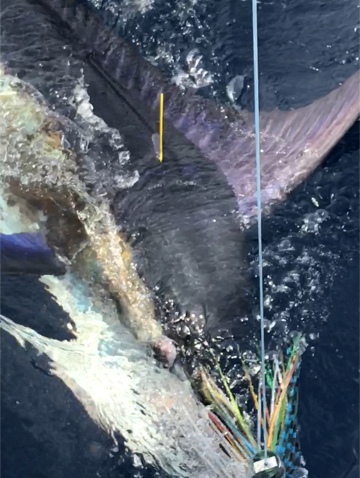 By default with no other billfish on the catch sheet the remaining places were to be determined by the next heaviest fish (between tuna and mahimahi). 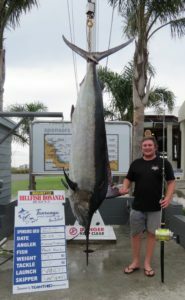 This was to be Brent Hoggs 23.9kg Yellowfin Tuna landing Team Aquarius second place. 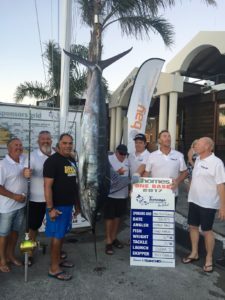 The next heaviest qualifying fish (over 10kg’s) was to come off Jans Decision, a nice 11.74kg Albacore netting the guys 3rd prize. 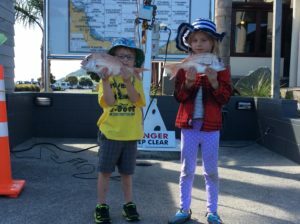 The tough fishing did have an upside for those at prize giving with some big banger prizes being lucky drawn and numerous spot prizes lifting the spirits of those that received no love from the fishing gods over the past three days. All in all this year’s GAME ON was a great event and nice to have the glamour weather on the last day. 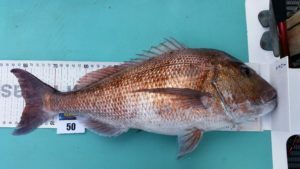 The unseasonal cool surface water has largely kept the big pelagic fish out of reach so far this year and impacted this year’s results. 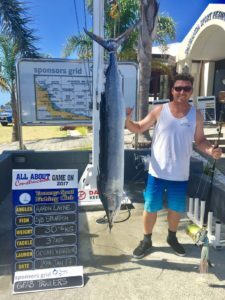 Mind you a new s/b Spearfish 37kg Mens Club record for Aaron Layne was a cool highlight and with plenty of albacore still around no one went without a feed of fish. 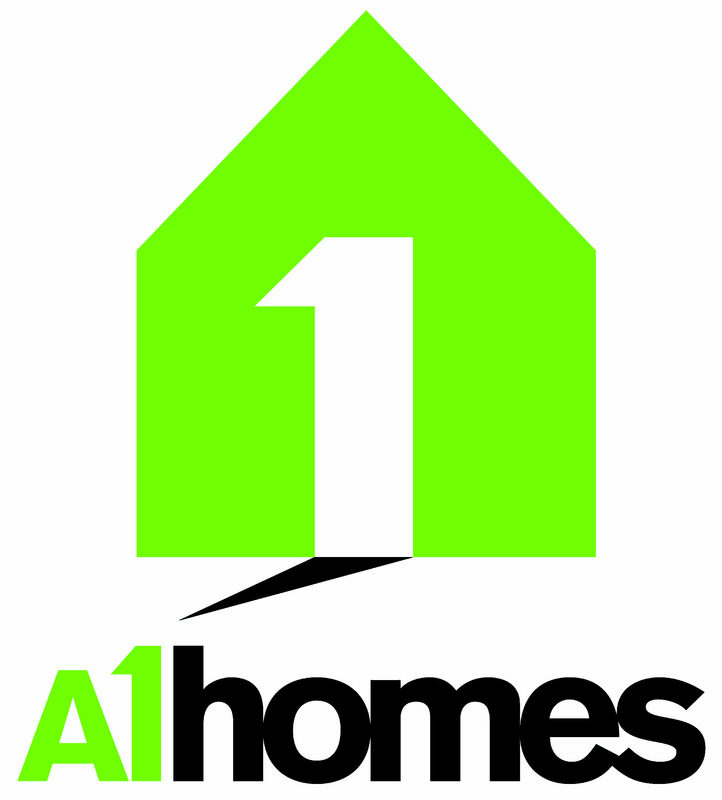 A big shout out to our sponsors All About Construction (who have already signed up for next year!) Duncan Reality, Wet & Forget, Maui Ocean Products and to Glass Art. Thanks again guys for your great support! 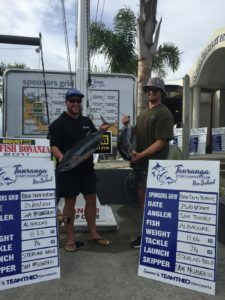 The build-up to this year’s event was fantastic with plenty of promotion over the airways, posters everywhere and our team of flyer droppers working hard to cover the bustling boat ramps on both sides of the harbour. Certainly the boat ramps from Boxing Day on are something to behold with any given sunny day seeing the ramp traffic swelling to 300 plus trailers just at the Sulphur Point ramp. 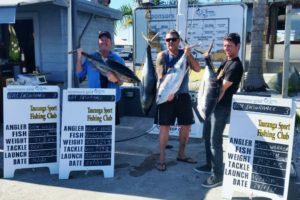 We sure do like our fishing over this period and this is why the timing of the Trailer Boat tournament is spot on! Weather is always a factor and this year we were blessed (unlike last year!) 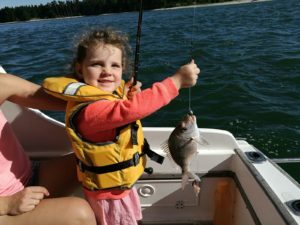 with a fishable forecast that over delivered with mostly clear skies and light winds. Our weather for the entire event pretty well bucked the strong westerly trend that has defined the start of summer, so it was nice to get lucky this time. 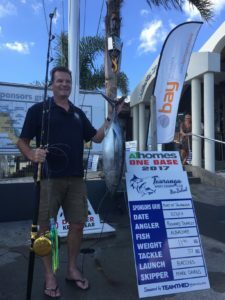 This year the Club was privileged to have not only Scott Parry from the TV show Fishing & Adventure on board but also all of the shows sponsors! 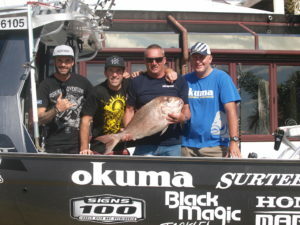 The shows Surtees aptly named ‘Holy Ship’ was also to fish the event kindly taking Stu from Okuma and Jack from Hirepool with the lads fishing hard and doing particularly well on the snapper and finding a patch of trevally that for whatever reason were tough to catch this weekend anywhere else. With the ‘random access’ rule in place the trailer boats were welcome to venture throughout chart54. Some of the teams choose the more northern waters of the Aldermans, and a couple of boats shot through to White Island and over-nighted. 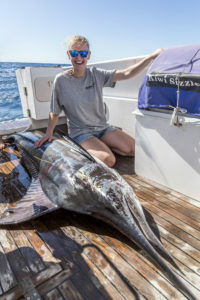 Miss B Haven was the only boat to come close to threatening the marlin prizes after playing a billfish for 20mins only to have the hooks pull! Bugger! 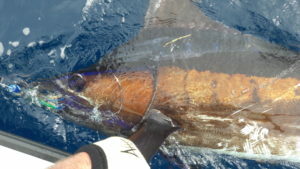 Other than this the pelagic offshore action was restricted to Albacore and a few skipjack that have yet to arrive. 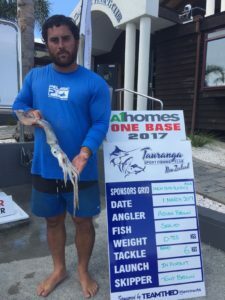 Brian Grey on Robot had a spectacular first day pulling a couple of puka and a nice measure and release kingie that took out two first places in these sections and did it solo! 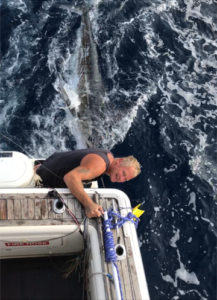 The Wally of the Weekend was contested by a couple of good yarns but taken out by our own Club Captain managing to hit a shark at 25knots on the way home…this did nothing for the health of the outboard. 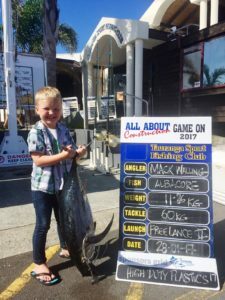 It was awesome to see the dozen junior’s anglers fishing hard and catching some nice fish, with Josh Leigh off ‘Wind Her UP’ pipping the rest of the field with a lovely 9.44kg Albacore Tuna. 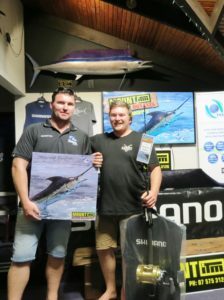 The Raymarine Hero Shot was hotly contested with Helen Eynon off Elevar receiving the Dragonfly sounder, a great pic and a deserving winner as judged by Scott from Fishing & Adventure…I reckon the F&A singlet helped her out! Anyway, thanks to everyone that came and fished this year’s event, we were thrilled with the fact that everyone had such a good time and look forward to delivering a bigger and better event for 2018!